The Cash for Cars team has been operating in Melbourne for over 10 years. We are a small, family owned and operated business, which all began because of our love of scrap metal recycling. We offer on the spot payments for all old cars, trucks, utes, motorcycles and vans. Once we have your old car, it will be crushed, then shipped off to one of our partnering recycling firms. From here it will be sorted into clean metal and recycled for a new purpose. This is a great way to do your part for the environment, rather than letting your old car whittle away to rust whilst it is sitting in your backyard or garage. If you aren’t able to get your old car to us, don’t worry, we offer a free removal and pick up service throughout the whole of Melbourne. We have enough resources that if you need your old car picked up ASAP, we will do our best to make it happen. The whole process is quick, easy and hassle free. It really is an easy way to make money fast. We provide free, no obligation quotes so get in touch with one of friendly team members today to find out more. We understand that people do not have the time in this day and age to go through the painful process of selling your broken down car. That is why Cash For Cars Melbourne VIC has provided Melbourne with an effective and simple way of removing your broken down car. We work on a quick easy, stress-free formula: contact us, provide us with all the details of the car you want removed, we give you an estimate and we’ll be there to remove it in no time! That’s how simple we work here at Cash For Cars Melbourne VIC Removals. 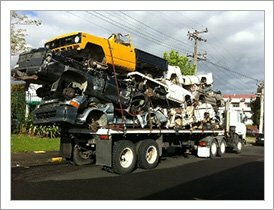 That is why for all your car removal services in Melbourne, you should be contacting us. All you have to do is contact us directly, or fill out our enquiry form, and we will be receiving some cash in your hand for that old bombed car of yours.